Fantasy Premier League takes a ten day break, due to EFL and FA Cup action. Here’s how you can use the period to improve your squad on a budget. Bournemouth, Burnley, Crystal Palace, Everton and Stoke have plenty of budget options. They have all been handed a nice long break, since they are out of the cups. This improves their chances of having fixtures in the potential blank Gameweek’s 31 and 35. Ben Crellin provides the blank percentages. Gameweek 31 clashes with the FA Cup 6th round. Callum Wilson is the in form budget third striker, with 3 goals and an assist in his last 5 games. Owning Kane and Aguero is emerging as a popular strategy, so Callum can release vital funds for a promising front line. The Gameweek 25 fixture is challenging, but the rest look promising: Wilson scored a hat trick against Huddersfield earlier this season. His starting place looks assured, since Defoe is out with a long term injury. There are very few budget friendly strikers, so Callum could provide a strong option until the end of the season. Burnley have three promising games in their next 4, having already kept clean sheets against Newcastle, Swansea and Southampton this season. It could easily be three more clean sheets in the next 4, as the Burnley back line are boosted by returns from injuries. Mee is a strong aerial threat, with goals and assists long overdue. Don’t forget that he’s also a BPS magnet and is guaranteed a fixture in Blank Gameweek 35. Clean sheets have been hard to come by in recent weeks at the budget end of things, but now is the time to jump on Mee to get ahead of the curve. The premium midfield and forward options are dominating the form charts, but this budget friendly option is going about his business quietly. He is the ideal fifth midfielder, or could even be considered as a fourth midfielder. Look into rotating the fourth midfielder slot, or alternating between a 4-3-3 and 3-4-3 formation. Mili has 3 goals in his last 6 games and is the first choice penalty taker for Palace. Zaha is the most fouled player in the Premier League and has already earnt several penalties for his team this season. He has 3 easy fixtures up next, and he has already returned against West Ham this season. Theo Walcott registered his first Premier League assist in 475 days on his Premier League debut. Everton definitely have a fixture in what is set to be the larger blank gameweek this season, gameweek 31. Walcott has made a positive start at Everton, getting an assist at the weekend. There’s huge points potential here from a player with a proven track record in the Premier League. Theo has a lot of work to do for the remainder of the season if he has any chance of getting into the England World Cup squad. He has three easier fixtures and also faces his former club in Gameweek 26 – I’m sure he will be fired up in his return to the Emirates. Stoke are certainly the most attractive option on this list. They are guaranteed a match in every gameweek up until the end of the season. In addition, they’ve got by far the easiest schedule over the next few, facing none of the current top 6. 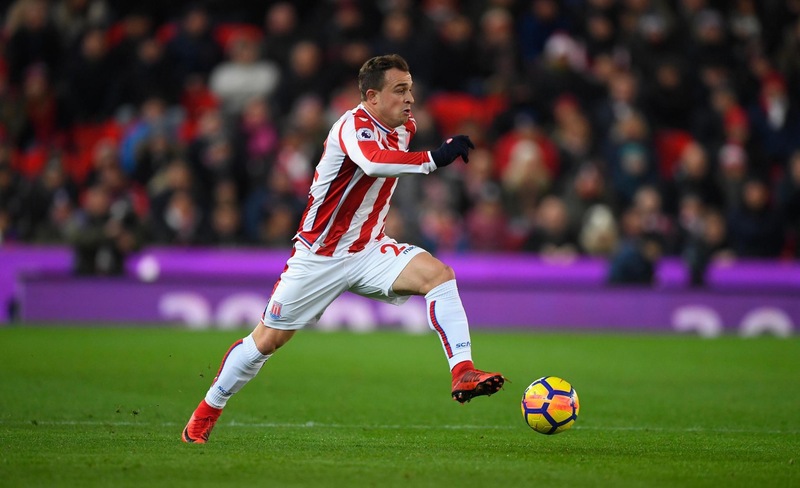 Shaqiri is the star of the Stoke attack and has amassed a respectable points total, despite the problems under Mark Hughes this season. He is now boosted by the arrival of a new manager and has performed against each of the above 0pponents he has faced: an assist against Watford, an assist against Brighton, a goal and an assist against Leicester. Before you go, take a look at the Form Vs Fixture Charts for Gameweek 25.